As a movie marketing nerd, I routinely read and study every movie communication and advertisement that comes my way. And over the years, my interest in movie marketing strategy has given me tons of ideas on how to help clients reach their own audiences and sell more movies. Like many traditional distributors, this is one of those companies that claims they “do marketing” for filmmakers. And unless you’re somewhat of a marketing nerd like me, you might get excited when a distribution company touts their ability to do email blasts. Taken at face value, this sounds powerful. But smart filmmakers know better than to fall for these film distribution shenanigans. 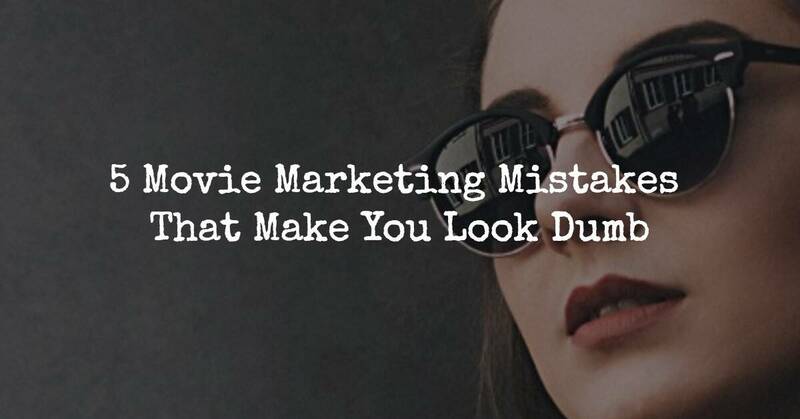 And in our short time together, I am going help you avoid the 5 movie marketing mistakes that make you look dumb. Even if you don’t consider yourself a promoter, it is important to know a thing or two about movie marketing so you can figure out who to work with. Here are 5 movie marketing mistakes that make you look dumb. 1. Buying or Renting Email Lists: It is never a good idea to buy or rent email lists. The people receiving your email don’t know you, don’t care about you and may not be interested in your movie. Additionally, you don’t know how those people got on the list in the first place. And unless they “opted in” to receive email communication, you could be violating spam laws. 2. Using a Stupid Display Name: In the email I referenced above, the display name in my inbox was from “marketing.” I don’t know anybody named “marketing” and neither do you. Like most people, when I see this in my inbox, I immediately think “marketing” is trying to sell something. So I delete! 3. Violating The Rule of WIIFM: Real marketing is a conversation that presents value. In the message referenced above, this distribution company violated the cardinal rule of marketing. Every bit of the content was about about “me, me, me.” And while I’m sure this company enjoyed talking about themselves, (as well as touting the fact they hired a new marketing manager – not kidding) the message provided absolutely NO value for me. 4. Not Respecting Your Audience: Movie marketing is all about knowing your audience and communicating value. What does your audience want? For example someone who loves romantic comedy will probably not want to watch your horror movie. So why on earth would you think marketing to these people is a good idea? 5. Fail to Measure Results: This should be a no-brainier, but unless you measure your results, how do you know what’s working? Without getting too nerdy on you, a good movie marketing strategy should pay for itself and then provide profit. In the event you are not making (at least) your advertising dollars back, then you’re in the black hole. Make sure you measure. I spend most days consulting with filmmakers and distribution companies about movie marketing. I help clients figure out how to avoid throwing money into a marketing black hole. If you’d like to find out more about my movie marketing tactics, check out my sell your movie system.